SkyBridge Infotech a Mobile apps marketing agency, helps you to reach the top charts in the AppStore/PlayStore. You are at the right place to market your Mobile app and get more guaranteed downloads. With over 2+ million apps in the Google PlayStore and Apple AppStore, its hard to stand unique against your competitors. But don’t worry, Mobile apps marketing experts at SkyBridge Infotech helps you to market your Mobile apps professionally and achieve ranking, improve downloads through our Mobile apps marketing efforts. We have wide experience in working with developers to co-ordinate and rolling out the right marketing strategies to improve the visibility of your app. We perform a detailed analysis of the Mobile Apps by comparing it with the competitors and provide suggestions and recommendations on improving the app for the upcoming versions. Optimization is one of the primary aspect in the Mobile Marketing and It helps to improve the visibility in the App Store and Play Store. To gain more visibility we will analyse the traffic for the keywords and we optimize to app keywords to get place in the top. Provide more downloads through in-app ads and paid advertisements. Improve Brand Awareness & Provide in depth pre-launch reports on App Store Optimizations (ASO), App Analysis, Competitive Analysis & User Testing. Generate more reviews for the app from mobile app users, authors and bloggers. Improve engagement & track campaign results. Understand the vital activities needs to be carried out and detailed reports that helps to have good kick start for the app while launching. Announce the availability of the app and improve the limelight of the app by adding more exposure. Drive downloads to the app after launching through paid ad campaigns. Generate more reviews about the app and monitor campaign reportings. Perform detailed app analysis on UI,Usability, Features etc. Identify your vital app competitors and compare with the app. Get comprehensive suggestions and recommendations for improving the app. ASO a crucial piece of app marketing which helps to improve the visiblity of the app and increase organic installs for the app through detailed keyword analysis, icon and screenshots validations, description etc. Utilize the power of social media platforms like Facebook or Twitter and run install campaigns. Drive installs to your app through paid ad campaigns. 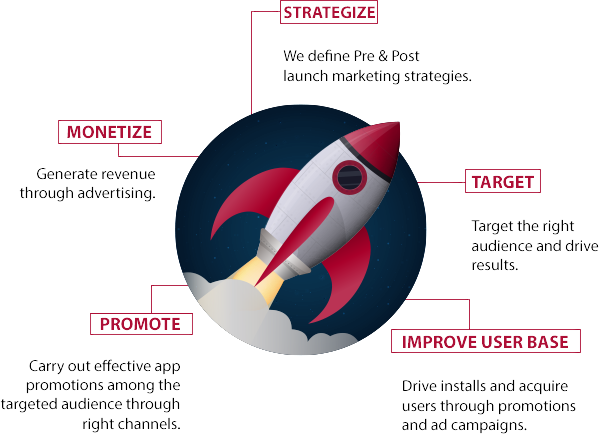 Identify keyfactors prior before the app launching & marketing the app after launch. Run a quick testing about the app from user's perspective. Check the feedback about the app from the user's words and make improvements for better user experience and improve the app. Improve visibility and give high exposure to the app through online press release media distribution. Get focus about your app in the tech sites and media agencies. Generate ratings and reviews from the app users. Trigger more downloads with positive ratings.